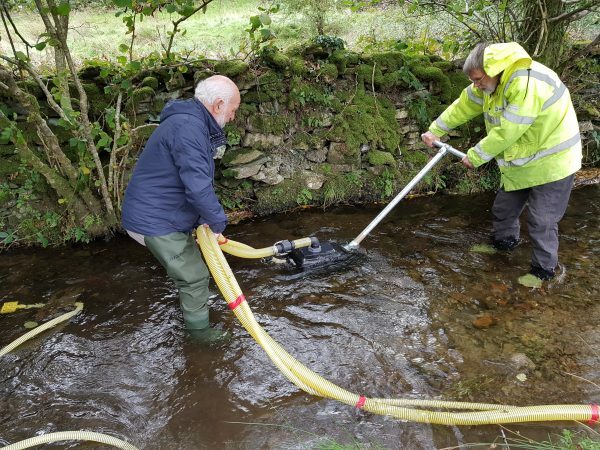 Clean Gravels is one of several activities aimed at improving spawning habitat for salmon in some of the catchment’s becks and the River Crake. Salmon lay their eggs in scrapes in the gravel, known as redds. The eggs, and young fry, need a good flow of oxygen through the gravels to grow. Sediment and silt can build up in the gravels through a lack of flow variation, as seen along sections of the River Crake as well as through excessive input from field run-off and bank erosion. The sedimentation means that oxygen flow through the gravels to eggs and fry is poor, resulting in high failure rates of salmon fry. Cleaning gravels aims to address the sedimentation issues, carried out in conjunction with other conservation measures in the project, such as the creation of buffer strips and tree planting. Cleaning gravels is not new, for years areas of potential spawning habitats have been raked in order to break up the compacted layers of silt, moving sediment to further downstream. However, it was felt that to make even better improvements then as much silt and sediment as possible needed to be removed out of the watercourse through a pumping system. Some considerable research was carried out, looking at other methods used across Europe and America, including an interesting looking sand wand. Project Officer Mike couldn’t resist a challenge and set about making one. The activity also received further funding from the Environment Agency through the Fisheries Improvement Programme (FIP) where partnership projects are delivered with fishing licence money, and from the Sir John Fisher Foundation. Trials of the equipment were carried out and modifications made along the way until we had something we thought would work and could be used by small teams of volunteers across the catchment. We felt our version of the wand was quite difficult to manoeuvre so we changed the method to control the jetting and the sucking out better by using a barrel. This also contain the stirred up silt too, resulting in less travelling downstream. Two training sessions were organised on two becks to put the tools and volunteers to the test. It was really good to see the team working together, suggesting further improvements and alterations to tools and techniques. Overall, the consensus was that the work was beneficial to the becks, and different becks would need a slightly different method of working. The working period for this is quite small (mid September to mid/end of October). The gravels need to be cleaned before the salmon start spawning to avoid any disturbance of fish or eggs, but not too far in advance in case of periods of heavy rain which would wash silt into the cleaned areas. Surveying for redds also tie into this, so that the work is more targeted. The work cannot be done without permission from the Environment Agency and the landowner and it is dependent too on water levels and weather conditions. The aim is to have more training sessions early September next year, then volunteer teams can clean gravel in targeted spots and becks, helping to improve spawning habitats for salmon. The few salmon that make it back from the oceans (it is estimated that only 5 out of a hundred do!) to spawn need all the help they can get.